There is a misnomer out there that I would love to bring to the table. (and since this is a post about the kitchen, how apropos is that?!) To those who think us stay and work at home moms have tons of time to cook elaborate meals is sorely mistaken! There are days that I am so busy between home school, work, cleaning and all the other stuff I do, the family is lucky to get Mac and Cheese from a box! I want to give my family the delicious and healthy meals they deserve, but I cannot always make that happen. What I need to do is work smarter in the kitchen and not harder. What I discovered was if I could make cooking easier, I could make great meals in a lot less time. With the amazing products from Lekue USA, I can spend less time in the kitchen and more time with my family. At Lekue, they want your kitchen experience to be fun as well as practical. The designs of their products are playful yet are functional. They want everyone, kids as well as adults, have fun in the kitchen experiencing recipes, foods and using cool products to do that with. By creating products that make trying out those recipes easier with unique shapes and colors, being in the kitchen is fun. Who said healthy cooking had to taste bland and be boring? Not the folks at Lekue! With products like the Steam Roaster, the Steam Case or the Cooking Bag, they offer cooks a way to cook without oils for a more balanced and healthy meal. Their innovative design concepts have won such awards like the Good Design Award in 2007 and 2010 as well as the Barcelona Innovation Award and the Trends Award in 2009 in the Frankfurt Trade Fair. I was sent the coolest two products that have revolutionized the way I cook. I will admit, I was hesitant to try any microwave cooking products because I imagined they would no cook the food properly. I had visions of hard or rubbery food that no one would want to eat. Instead, I got a pleasant surprise when I used the Pasta Cooker, which sells for $35.00 and the Rice Cooker, which also sells for $35.00. 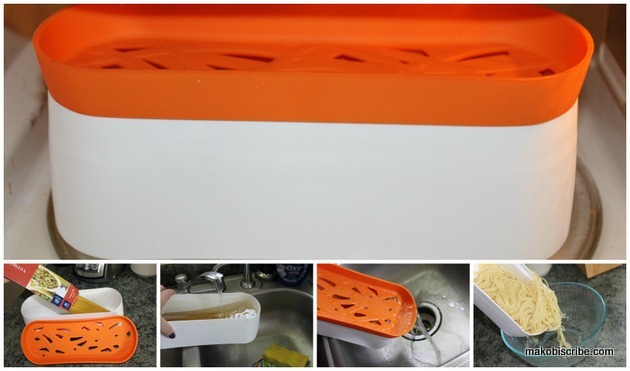 They are both easy peasy to use, you do not need to break the pasta and it takes only a few minutes. I made pasta for the kids in less than 10 minutes, with no boiling water and heavy pots and the pasta was a perfectly cooked as anything I have ever made on the stove. The same can be said about the Rice Cooker. The rice was cooked to a perfect fluffiness and tasted as good as any I could have made in a traditional way. I am ecstatic about my products from Lekue and I know you would be too! Be sure to like them on Facebook and Twitter. Previous articleWhy Would You Need A Custom Designed Rug? I would love the rice cooker. I would like to have the Defrosting and Draining Net, Blue, 9.5″. I’d like to have the Rice Cooker, Green. I would love to have the orange pasta cooker! The little cakes cookers too! I like the 250ML Portion Saver. I would like to have the mini cake mold. There are so many great prizes . The rice cooker is so cool! I don’t own an electric rice cooker, I cook it on the stove which requires my full attention so it cooks properly. To be able to cook it in the microwave would be awesome. I’d like to have the Portion Saver, 250ML, Set of 2. I would like to win the rice cooker. I would like the Sandwhich Buddy, Blue, 9″. I need the rice cooker, awesome! I also liked their 1qt red steamer, thanks. I like the Classic Cat Ice Cube Tray. I would like the pasta cooker. I want the Lékué Collapsible Steamer, Green, 2.5 Qt. Lékué Collapsible Steamer, Green, 2.5 Qt. I will choose the rice cooker because I always seem to under or overcook my rice. I WOULD LIKE THE PASTA COOKER. I ALSO LIKE THE Round Cake Mold, Black. The pasta cooker would be so helpful for me! I like the Collapsible Steamer, Green, 2.5 Qt. I would want the rice cooker. I like the pasta cooker. I would like the rice cooker in green! I am a carb gal so the pasta cooker! Thanks for the giveaway…Pasta Cooker ! The pasta cooker so I don’t have to always get out my huge dutch oven to cook pasta in. I’d use the Defrosting and Draining Net, Clear, 9.5″. I like the mini brownie tin. The Lékué Large Microwave Pot Ogya in green looks wonderful. I seem to be a klutz with rice so I would like the rice cooker. I have a feeling it will work better for me than traditional boiling. I’d love the Collapsible Steamer. I like the Imperial Royal Crown Copper Mold 3 Cups. Thanks for the great giveaway opportunity. Keep up the terrific blogging. Pasta cooker would be great. I would like the pasta one. I’d like either the pasta cooker or rice maker. I HATE making both of those things! I would love to have the Pasta Cooker. Pasta Cooker would be great to have! I would love the Lékué Large Steam Case with Tray, Clear, 1 qt!! I eat a lot of brown rice and would LOVE the rice cooker! So much easier in the microwave! Thanks for this opportunity! I visited the site and really like the Jelly Roll Kit. I would love to have the Pasta Cooker in our kitchen! I would like the pasta cooker! I would want the pasta cooker!! I would like the Pasta cooker …. I would love to try the pasta cooker as we eat a lot of pasta! I would have to try the rice cooker first. Loooove the Food Steamer Case! Our family eats a lot of pasta. We could use the pasta cooker. If I had to choose, I would Love the Pasta Cooker. I really like the 1 quart Large Microwave Pot Ogya in Red. I like the Terracotta Canneleé Bordelais Mold, 8 Cavity! So many awesome products! I’d really like the rice cooker, plus a lot of other things they have! I like the red omlette cooker. Recently been reading more and more about how microwaving food depletes what little nutrients are left after all over farming and over processing our food supply. My daughter took water and microwave it. let it come to room temp and then watered a plant for two weeks with it. regular thriving houseplant. it died. it was in a glass pyrex cup. so we cant blame BPA – but it made me start rethinking – between BPA and the bad things they are now finding in popcorn BAGS and steamBAGS – does this company have good things to claim? Are they willing to back it up? I really like the 1 quart Large Microwave Pot Ogya in Red. This would definitely help save time in the Kitchen. I like the Terracotta Heart Mold, 8 Cavity pan. I would love to make little hearts for birthdays. If your question is which of the two prizes I’d prefer, I’d choose the pasta cooker, since I have a rice cooker which I use all the time. However, Leuke has lots of great items, and I love their silicone baking molds, and one in particular I’d love to have is the 30-cup Mini Cake Mold. Of the 2 to win, the rice cooker. Among their other items I’d like the Lékué Collapsible Steamer, Green, 2.5 Qt. I’d love the Food Steamer Case!